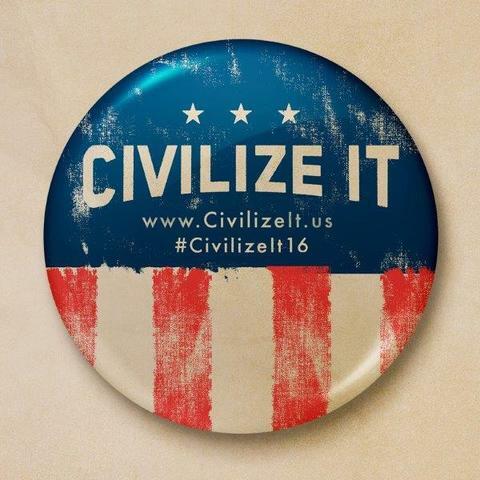 CINCINNATI -- Since last spring, the Archdiocese of Cincinnati has conducted a “Civilize It” campaign designed to help raise the level of political discourse in light of the November elections. The idea of the campaign is to instruct faithful Roman Catholics in how their beliefs should inform their votes, but also how to discuss their differences with those who disagree without resorting to name-calling. The campaign has prompted two basic responses, said Tony Stieritz, the archdiocese director of Catholic social action. The behavior of candidates is too often not a very good role model for civil and substantive dialogue, Stieritz said. When Pope Francis visited the U.S. last year and spoke to Congress, he talked about the importance of dialogue, said Sean Ater, director of the archdiocese’s office of new evangelism. Soon after, the staff began thinking about how it could impact the upcoming presidential campaign. Every four years, the staff does a program of talks to parishes about how Catholic teaching applies to citizenship, Stieritz said, and this year, the archdiocese is combining that program with Civilize It. The campaign has three aspects, Ater said: a social media campaign, the in-person talks at individual parishes and a political-style campaign of yard signs and car magnets. The social media campaign includes an online pledge individuals may sign onto with three core concepts: civility, clarity and compassion. Stieritz said a civil conversation about politics remains open to the idea that no side has a complete monopoly on the truth. In the case of the pledge, Ater said clarity means pledging to take time to think about what’s important and form your conscience before you vote. For Catholics, that would mean looking to what the Catholic church says, but for others it might mean reading the Bible or consulting another faith tradition, he said. Showing compassion to someone you disagree with, Stieritz said, means that even if a dialogue leaves you no closer to agreement, you still have a sense of respect for your opponent. As of the end of September, the pledge had been shared more than 1,300 times on Facebook, Ater said, and 283 people had signed it. By the end of the presidential campaign, the archdiocese staff will have made 15 presentations of Civilize It and Catholic citizenship at local parishes. In those talks, Stieritz said, they rely heavily on an essay by Cardinal Donald Wuerl, the archbishop of Washington, D.C.
Wuerl lists seven ground rules for civil dialogue, including making sure everyone has a chance to speak and not interrupting a speaker unless it's for clarification or time keeping. The presentations typically involve an introduction to the Civilize It campaign, then a discussion on what the church sees as the really important issues in the campaign, Ater said. Those would include traditionally conservative issues such as being against abortion, he said, and traditionally liberal issues such as advocacy for immigrants. Turnout at the presentations has ranged from a dozen people to up to 50 depending on the location. The website includes a link to a toolkit that parishes, dioceses and archdioceses across the country may use to run a campaign of their own, and Ater said some have done so. Will the campaign make for a less contentious election season? The hope is that it might create a grassroots movement that bubbles up to politicians.